This hotel is 100pct non-smoking Unparalleled among downtown Atlanta hotels the DoubleTree by Hilton Hotel Atlanta Downtown exudes Southern hospitality with refined style and personalized service. We are conveniently located off I-85 20 minutes north of Hartsfield Jackson International Airport /ATL/. With a great location the Georgia Aquarium and America*s Mart within walking distance on one side of this downtown Atlanta Georgia hotel and Centennial Olympic Park the Georgia Dome Philips Arena and CNN Center on the other the DoubleTree by Hilton Hotel Atlanta Downtown is ideally situated in the heart of downtown. From the famous DoubleTree cookie upon arrival to the welcoming staff and contemporary comfort of the surroundings this downtown Atlanta hotel makes your trip hassle-free. Revitalize body and mind in over 300 beautifully appointed guest rooms perfect for a cozy weekend away or while attending a corporate conference at this premier business-friendly hotel in downtown Atlanta. Our guest rooms feature 32-inch HDTVs with an extensive selection of HD premium channels wired and wireless internet connectivity as well as laptop-compatible safes. Stay connected with complimentary WiFi in our lobby public spaces 24-hour business center restaurant and lounge. In-room WiFi is available for a nominal fee. Our downtown hotel is blocks from many area businesses to include Deloitte Georgia-Pacific Corporation Georgia Power Southern Company American Cancer Society The Coca-Cola Company Ernst - Young SunTrust Bank Turner Broadcasting and Wachovia. With over 14 000 sq. ft. of flexible downtown Atlanta hotel meeting space our world-class facilities are the perfect setting for intimate meetings lavish receptions or fundraiser galas. 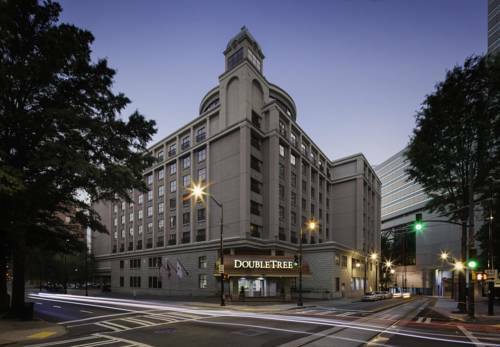 Whether staying on business or enjoying the city with family and friends the DoubleTree by Hilton Atlanta Downtown sets the precedence for combining casual elegance and Southern charm among hotels in downtown Atlanta GA.
Reservations must be cancelled 24 hours prio to local hotel time to avoid penalty. Early Departure fee is $100.00.